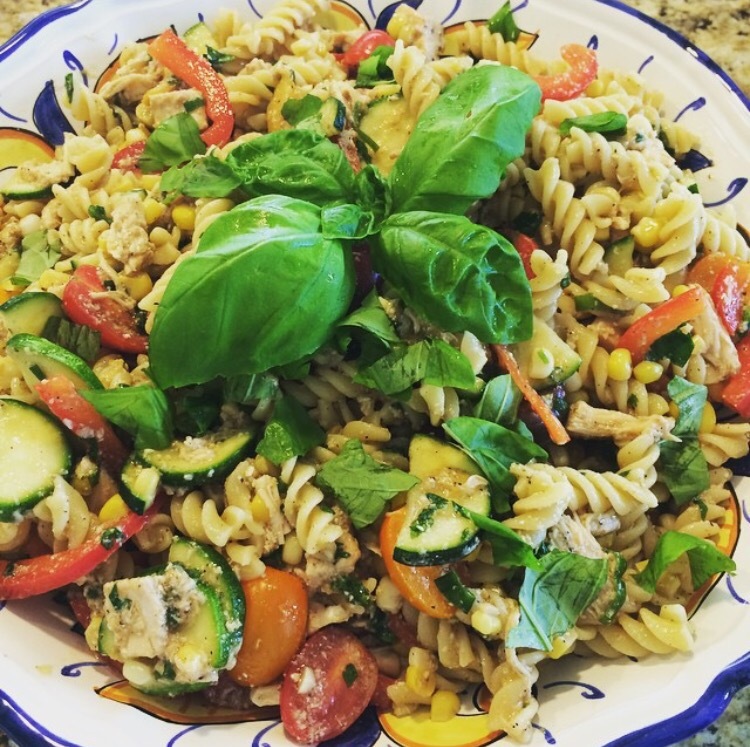 Pasta salad is one of the most delicious side dishes in my opinion. It is a summer food that pairs perfectly with everything from burgers to chicken to mile high sandwiches. The key to amazing pasta salad is using the freshest veggies and fruit during the peak of the season. -A container of mixed rainbow cherry tomatoes, 2 small zucchinis sliced into half moons, 1 red pepper thinly sliced, 1 cup corn sliced off the cob, a few green onions sliced finely, 2 ripe, firm peaches sliced, 2 cups chopped rotisserie chicken (optional), and a handful of fresh basil and cilantro chopped. Combine 1/2 cup shredded Parmesan, 1/2 cup EVOO, juice and zest of a lemon, 1 tablespoon balsamic vinegar, 1/2 teaspoon minced garlic, 1 1/2 teaspoon black pepper, 1/2 teaspoon salt, 1/4 cup chopped cilantro, and 1/4 cup chopped basil. Pour over mixture, combine, then fold in your pasta. Enjoy!! !